Pimcore provides the ability to define preconfigurations for documents, which makes it easier for editors to work with many different controller/action and templates. By using this feature the editors don't have to have any knowledge of which controller/action/template should be used in a specific document because they can choose out of a predefined set of configurations with a friendly name. To define document-type go to Settings > Document-Types. Let's suppose that you've created controller, action and template for a books listing. 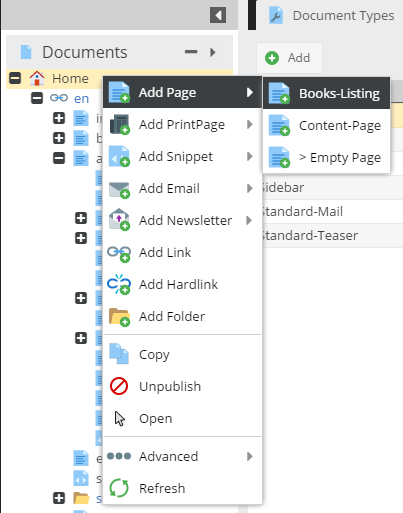 To add a new document-type which renders the book listing template, you have to click on the Add button first and then fill out the newly created configuration row accordingly. The type can be either a page, snippet, email, newsletter, printcontainer or printpage.